I am looking forward to meeting one of my greatest “REAL LIFE HEROES” again after close to six years . Well, I feel no one would be better choice to inaugrate our Kovalam Projects for the people than the widely popular “Peoples (ex) President” of our country – Dr.Abdul Kalam. As I look forward to meeting him again, I recall the day he first visited The Banyan in the year 2001. It was an afternoon, the day before our 8th anniversary function for which he was to be the Chief Guest. He was the Scientific Advisor to the Defence Minister at that time and had also been awarded the Bharat Ratna that year. His humility and modesty were evident from the minute of his arrival when he stopped the horde of high level security officers accompanying from entering The Banyan stating he was on a personal visit and didn’t want to disturb or frighten the residents. 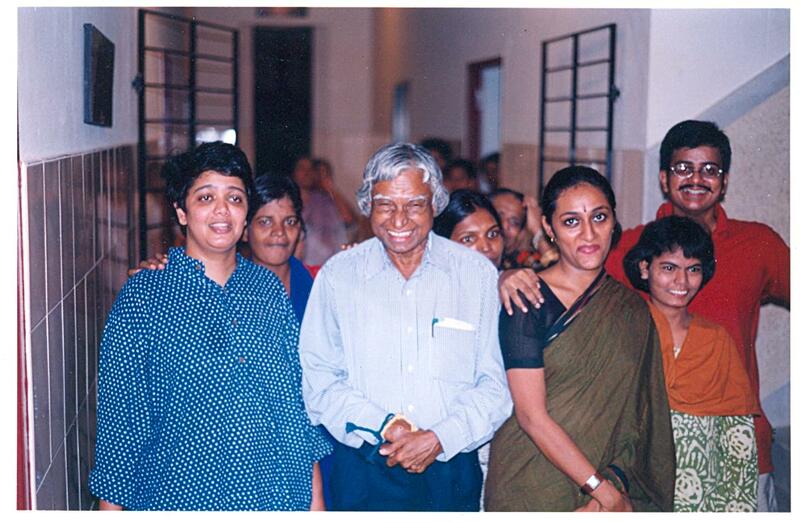 He was shown around the building by Vandana, Vaishnavi and others – along with a starry-eyed ME!! He spent close to an hour going to all the floors and interacting a lot with the residents. He got to know, in detail, how The Banyan’s system works from the time a resident Is referred or picked up by us till the stage when they are rehabilitated and reintegrated with their family. At the end of the rounds I was given the opportunity for an exclusive photograph with him in the Conference hall. Those moments will be cherished by all – starting with me for a lifetime. And the framed photograph in my house is there to cheer and inspire me every day… The following year he was chosen to occupy the highest office of our country. During his tenure as President he supported worked on various social issues including mental illness – the area in which The Banyan works. Now he his back to his favourite occupation, teaching. It’s certainly an honour for us to have him back in the city and our midst once again to inaugurate the Kovalam Projects. Previous Previous post: Once a diplomat, one for life!